Lag your pipes to avoid them bursting during freezing weather. Install a greywater recycling system. Greywater is any household wastewater (from the sink, shower, washing machine, etc) except toilet water, which is blackwater. It can be safely reused on lawns and gardens. Reusing greywater not only reduces freshwater consumption, it also reduces strain on a septic tank or treatment plant, recharges groundwater, and maintains soil fertility by providing nutrients. A greywater recycling system can be a good choice for many homeowners, but one must first consider the climate, suitability of topsoil to receive greywater, and any permit requirements before installation. 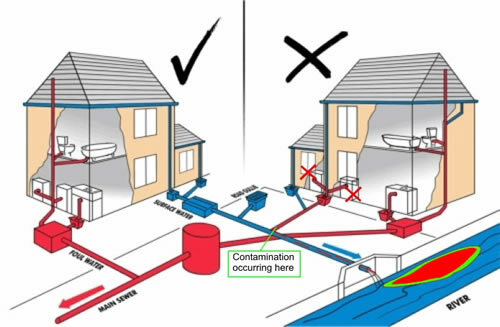 In the UK, plumbing misconnections are common in older houses (pre-1970s) or in houses with extensions. There are two distinct drainage systems. One system removes rainwater from gutters, through downpipes, usually through open drains and straight into rivers or other water courses untreated. The second system removes grey water and wastewater to the sewerage system and on to water treatment plants. If wastewater pipes are connected to the wrong system, untreated sewage from our toilets, baths and showers, dishwashers and washing machines, containing harmful chemicals and other waste products go directly into our rivers and streams. This is not just causing pollution and harming wildlife, it’s also illegal – and it’s the current householder’s responsibility to put it right.